Last week's global stock rout returned despite Friday's tentative bounce, as the selloff resumed in Asia with China tumbling 1.5%, closing at a fresh 4 year low, dragging European shares lower with S&P futures sliding 0.5% and Nasdaq futs down -0.8% on Monday, as a new diplomatic crisis between the US and Saudi Arabia added to a list of investor concerns and drove up oil prices. Safe havens bounced, led by Gold with Treasuries and the yen also rising. “The breakdown in Brexit talks, the disappearance of dissident Saudi journalist Jamal Khashoggi, the demise of the CSU in Bavarian elections, the impasse over Italy’s budget and the worried tone coming from the IMF/World Bank meeting in Bali all combine to give financial markets an uncomfortable feel this morning,” according to SocGen FX strategist Kit Juckes. A renewed threat by Trump to impose more sanctions on Beijing overpowered encouraging words from China’s securities regulator, accelerating the $3 trillion rout in China's stock market, while evidence of weakening domestic demand added to concern about the trade war with the U.S. 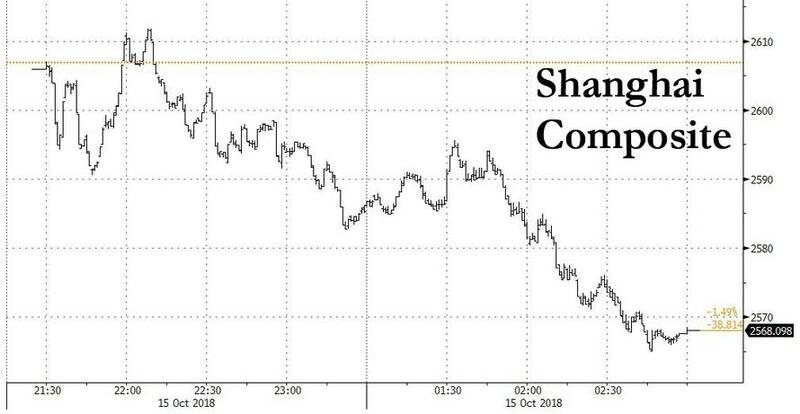 The Shanghai Composite Index fell 1.5%, closing at session lows and the lowest level in the index since November 2014 following a weekend of warnings on global economic fragility from finance chiefs meeting at an annual IMF gathering. Over the weekend, President Trump threatened to impose another round of tariffs on China in an interview with CBS’s “60 Minutes” that aired Sunday. When asked whether he wants to push China’s economy into a depression, Trump said “no.” Also over the weekend, at the IMF annual meetings in Bali, finance officials weighed tremors rattling the global economy, from stock sell-offs to trade concerns and rising U.S. rates. The Shanghai Composite has slumped 19% in the past six months and is in a bear market since its January highs as trade tensions increased and data signaled a slowdown in the economy, while the yuan has fallen more than 9%. A gauge of consumer-related shares dropped the most after data showed purchases of passenger vehicles and online appliance sales slumped in September. Liu Shiyu, chairman of the China Securities Regulatory Commission, said the country will deepen capital market reforms and press ahead with opening up after he met with investors. The subindex of consumer discretionary stocks fell 2.1%, the most among the CSI 300 Index’s 10 industry groups. Great Wall Motor Co. slumped 9.4 percent to its lowest since 2012, while Qingdao Haier Co. tumbled 9.2 percent. "The fundamental issues that haunt investors -- lower global risk appetite and a slowing Chinese economy -- remain," said Ken Chen, Shanghai-based analyst with KGI Securities Co. "The market will only recover if those concerns are resolved, and it’s going to take more than just verbal promises." The Hang Seng Index fell 1.4% after three weeks of losses, while the Hang Seng China Enterprises Index dropped 1.5%. Tencent Holdings Ltd. slumped 1.9%. 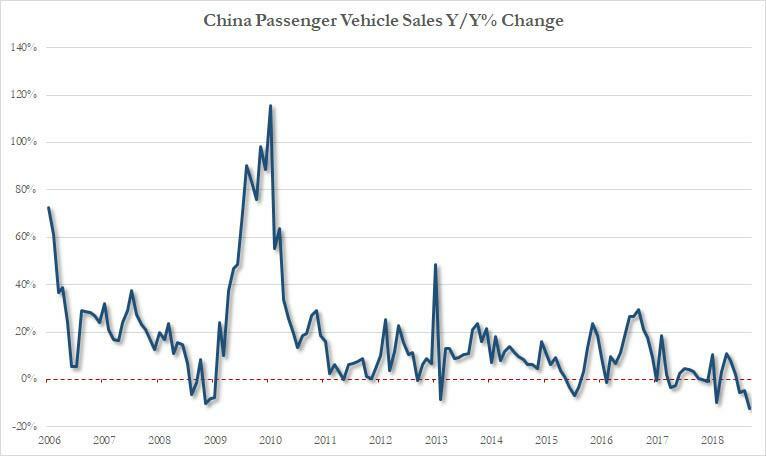 As we reported last week, purchases of passenger vehicles by Chinese dealerships plunged for a third straight month in September, dropping the most on record. Over the weekend, Steven Mnuchin expressed concerns about the yuan’s weakness and called for a currency clause that would prevent competitive devaluations to be included in any trade talks with Japan. Separately, China’s ambassador to the U.S. said Beijing has no choice but to respond to what he described as a trade war started by the U.S.
Asian weakness spread to Europe, where industrial goods makers and technology firms were the biggest losers in the Stoxx Europe 600 index. In Frankfurt, stock trading has resumed after the opening was delayed by a technical glitch. Main European Indices are mixed amid current market uncertainty; the Dax is up (+0.3%) despite being weighed on by Lufthansa which is down by over 3% following agreements on new employment conditions, featuring moderate salary increases. Sectors are mixed with IT lagging at -1% as a follow on from poor IT performance in Asia due to continued U.S-China tension; this is despite Friday’s Wall Street rebound for IT which saw it as the leading sector finishing up by 3%. Convatec shares tumbled over 25% following a cut in revenue guidance. The Bloomberg Dollar Spot Index slipped while Treasuries climbed amid the risk-averse mood. Most Asian currencies fell against the dollar, led by the Indian rupee and South Korean won as the rebound in global equities Friday failed to follow through after the weekend IMF gathering. The British pound was volatile, paring a drop of as much as 0.5% after the U.K. and the European Union remained on course to miss this week’s key milestone on the road to a Brexit deal after talks broke up in stalemate on Sunday. The yen pushed higher while gold headed toward its fourth advance in five days. Italian bonds erased earlier gains as the nation prepares to meet Monday’s midnight deadline for euro-area governments to turn in fiscal budgets. Meanwhile, Crude and Brent are up 0.6% and 0.9% respectively amidst supply concerns following possible U.S sanctions against Saudi Arabia over missing journalist Khashoggi, which Saudi say they will respond in kind to if implemented. Prices are currently just over USD 71.5/bbl and USD 81/bbl respectively. Additionally, IEA’s Birol stated that high oil prices are hurting consumers and that extra barrels will need to come to the market soon to avoid further tightening. Gold is once again up with mass uncertainty in the market from unproductive Brexit talks, US-China trade war and Italian’s budget deadline day causing investors to move into the safe haven. Global trade tensions have also caused selling pressure in London metals causing prices to slip. Shanghai rebar steel futures climbed to their highest levels in over 3 weeks, boosted by expectations that China’s sustained anti-pollution campaign could further disrupt production. Saudi Arabia: Trump says Saudi would face "severe punishment" if linked to disappearance of Khashoggi; State news says kingdom will retaliate against any measures with even stronger response. Asian equity markets resumed last week’s stock rout as the region failed to take impetus from Friday’s rebound on Wall Street where tech outperformed and all majors finished a tumultuous session in the green, albeit with losses of around 4% on the week. 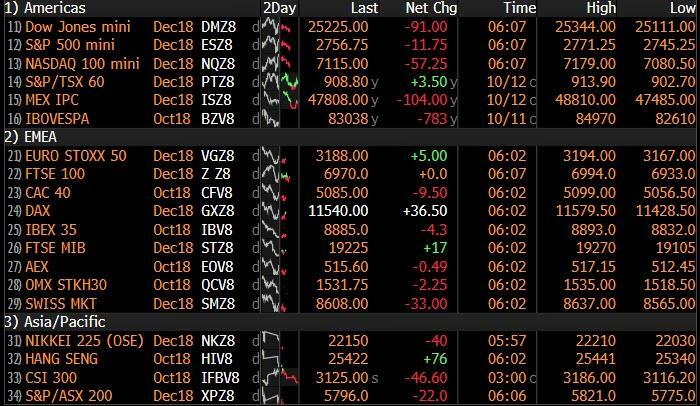 ASX 200 (-1.0%) slumped from the open as financials and tech led the broad losses which dragged the index briefly below the 5800 level, while Nikkei 225 (-1.9%) suffered from continued flows into the JPY. Elsewhere, Shanghai Comp. (-1.5%) and Hang Seng (-1.4%) conformed to the negative tone with sentiment not helped by President Trump’s reiteration that the US may have to impose another round of tariffs on China, with indecision seen in the mainland after the PBoC skipped open market operations and refrained from rolling over maturing MLF loans as its previously announced 100bps RRR cut took effect. Finally, 10yr JGBs were pressured at the open and tracked the recent weakness in T-notes, but then recovered as the widespread risk averse tone spurred safe-haven demand. which is down by over 3% following agreements on new employment conditions, featuring moderate salary increases. Sectors are mixed with IT lagging at -1% as a follow on from poor IT performance in Asia due to continued U.S-China tension; this is despite Friday’s Wall Street rebound for IT which saw it as the leading sector finishing up by 3%. Convatec are down by over 25% following a cut in their revenue guidance. Chr Hansen are up by over 2% following a positive earnings update and reports that their chairman will not seek re-election, with Dominique Reiniche to be nominated as the next chairman. In FX, JPY - The clear G10 outperformer and beneficiary of a downturn in Asia-Pacific stocks as jitters over global trade, protectionism and sanctions undermined sentiment. Usd/Jpy has retreated from 112.25 highs and through 112.00 to a 111.70 low, breaching the 55 DMA at 111.83, while Eur/Jpy is back below 129.50 alongside broadly softer Jpy crosses. From a technical perspective, 111.50 will be eyed next on the downside as a psychological marker and 50% Fib, roughly aligning with daily support around 111.47 plus decent option expiry interest between 111.55-40 (1 bn). GBP - At the opposite end of the spectrum, the Pound has been undermined by a breakdown in talks between the UK and EU just days ahead of the latest scheduled Brexit summit that may now take the form of a no deal meeting given the ongoing Irish border impasse. Cable has managed to regain some composure and recoup losses under 1.3100, but Eur/Gbp is holding above 0.8800 where a hefty expiry lies (1 bn). In EM - The Try remains bid just off 5.8160 peaks vs the Usd on follow-through buying/relief in wake of the release of US Pasto Brunson, while the Rub and Zar are also up vs the Buck (circa 65.6500 and 14.4500) on firm Brent and Gold. In commodities, Crude and Brent are up 0.6% and 0.9% respectively amidst supply concerns following possible U.S sanctions against Saudi Arabia over missing journalist Khashoggi, which Saudi say they will respond in kind to if implemented. Prices are currently just over USD 71.5/bbl and USD 81/bbl respectively. Additionally, IEA’s Birol stated that high oil prices are hurting consumers and that extra barrels will need to come to the market soon to avoid further tightening. Gold is once again up with mass uncertainty in the market from unproductive Brexit talks, US-China trade war and Italian’s budget deadline day causing investors to move into the safe haven. Global trade tensions have also caused selling pressure in London metals causing prices to slip. Shanghai rebar steel futures climbed to their highest levels in over 3 weeks, boosted by expectations that China’s sustained anti-pollution campaign could further disrupt production. It’s a quiet start to the week. In the European morning, the only release of note in Europe is Italy's August general government debt numbers. In the US, we’ll see the October Empire manufacturing release along with September retail sales and August business inventories. Away from the data, ECB vice president Luis de Guindos will speak at an event in Madrid while, Euro-area countries including Italy send final budgets to the EC for approval. Bank of America will report earnings. Most of the blame for last week’s market turbulence was the move in yields from the previous week. The support actors have been Italy, the ongoing trade dispute and perhaps a little bit of Brexit uncertainly (of which the news flow hasn’t got much better over the weekend. US bond markets should take most of the responsibility though even if they did rally back a little in the latter part of the week. Given this, its worth highlighting that over the weekend here at DB we have reiterated our 2018 YE 10-year Treasury forecast at 3.50% but edged up the forecast to 3.70% for Q1 2019 and at 3.80% by the end of Q3 2019. By YE 2019 the forecast is back to 3.60% due to the possibility of the house view of potential US rate cuts in H2 2020 being priced in after five more hikes before the end of next year. In addition, 10-year Bunds are expected to be 1.25% by the end of 2019. See the report here for more details. The key events for this week are the Italian budget being submitted to the EC today, China’s inflation data tomorrow, the latest FOMC minutes on Wednesday, the EU leaders Summit to discuss Brexit on Wednesday and Thursday, China’s monthly data dump on Friday and US earnings season kicking slowly into gear. Brexit headlines here in the UK will likely to be intense all week with negativity being the overriding theme last night as Brexit Secretary Raab travelled to Brussels yesterday to communicate to Michel Barnier that Mrs May couldn’t sign up to what is currently being offered and discussed. Elsewhere, EU’s chief Brexit negotiator Michel Barnier tweeted yesterday that “despite intense efforts, some key issues are still open, including the backstop for IE/NI to avoid a hard border.” The pound has fallen -0.35% in Asian trading as a result. This news followed intense weekend negotiations with many hoping today would see the outline of a deal announced. This seems highly unlikely now and some attention will turn to whether this week’s EU leaders summit will conclude that the November summit should be about preparing for a no-deal Brexit instead of ratifying a successful one. Tomorrow the UK has a cabinet meeting devoted to Brexit so plenty to watch out for. At this point in time I’ve absolutely no idea how this is all going to work out. There are so many immovable obstructions on all sides. However, with all things EU related over the years one learns that until 23.59:59 ticks over to midnight then there’s always a chance of a deal. Staying with weekend politics, the Bavarian election saw the CSU - German Chancellor Angela Merkel’s coalition partners - see their vote share decline to 37.2% down from 47.7%, marking the worst performance for the CSU since 1950 while the center-left Social Democrats share declined to 9.7% down from 20.6%, marking the worst performance since World War 2. The Greens and AfD’s vote share rose to 17.5% and 10.2%, respectively. Our economists have previously stated that a poor showing for the CSU might trigger a reshuffle of Merkel’s cabinet, i.e., the ousting of Seehofer as Minister of the Interior, fostering better co-operation among the Groko, enhancing the federal government's efficiency, and shifting the government’s stances, especially on asylum policy and European policy. The exact impact will depend on the CSU's future coalition partner in Bavaria. Their baseline scenario is for a coalition among the CSU, the Free Voters, and the FDP. The week has started off with a risk-off tone in Asia, despite last Friday’s rebound in global equities. The Nikkei (-1.30%), Hang Seng (-1.01%), Shanghai Comp (-0.79%) and Kospi (-0.52%) all lower. Elsewhere, futures on S&P 500 (-0.18%) are pointing to a slightly weaker start. Overnight, BoJ Governor Kuroda said that “the amount of JGB purchases is no more the monetary operating target” adding, “It’s only yield curve control.” This further reinforces that the BoJ’s commitment to buy JPY 80tn of JGBs each year is only symbolic now. Last week was a tough one for risk assets, with most major equity indexes posting their worst week since the February-March sell-off even if Friday ended on a high as we’ll show below. The S&P 500, DOW, and NASDAQ closed -4.10%, -4.19%, and -3.27% lower on the week. Cyclical sectors - industrials, materials, financials, and energy - were the worst-performing sectors, while the safe havens of utilities and consumer staples were the best performers. Small-caps continued their recent trend by lagging behind the broader market, with the Russell 2000 down -5.23%, their worst week since January 2016 and their 7th consecutive week of underperformance versus the S&P 500 – the longest such streak in over a year. The VIX index rose to as high as 28.8 and closed at 21.3, its highest level since April and biggest move since March. The Euro Stoxx 600 shed -4.64%, roughly in line with the DAX (-4.86%) and CAC (-4.91%), while the FTSEMIB lagged behind (-5.36%). In Asia, the Nikkei and KOSPI shed -4.58% and -4.95%. Chinese bourses were hit hard after being closed for the first week of October, with the CSI 300, Shanghai Composite, and Shenzhen Composite losing -7.60%, -7.80%, and -10.07%, respectively. Broader emerging markets actually held up well over the course of the week, with the MSCI EM index down only -1.35% and EM currencies gaining +0.76%. They were boosted by a soft US CPI print on Wednesday and a generally softer dollar (-0.38%). On Friday markets found their footing and pared their losses, with the S&P 500, DOW, and NASDAQ gaining +1.42%, +1.15%, and +2.77%, respectively, on the day. Treasury yields resumed their rise, rising +1.5bps on Friday but were still -6.8bps lower on the week. Given the equity sell-off this was a relatively mild rally showing that there does seem to be a structural element to the recent rise in yields. Elsewhere, Bunds outperformed and yields dipped another 2.0bps to take their weekly rally to 7.5bps, while peripheral spreads were mostly wider. Noise continued to emanate from Italy regarding the budget, but we didn’t get any substantive new information and the sell-off in BTPs (+15.3bps) wasn’t notably more painful than in Spain (+9.7bps) or Portugal (+9.9bps). After the close on Friday, Moody’s upgraded Portugal’s debt to investment grade, though it feels more like the agency catching up to the market than the other way around. US banks effectively kicked off the third quarter earnings season on Friday, though the results were understandably overshadowed by the broader market moves. Still, they were mostly positive. Citi posted lower expense than expected while maintaining revenue in line, JP Morgan saw revenues grow a healthy 7% yoy, and Wells Fargo exceeded DB’s expectations on costs despite a headline earnings miss. Bank stocks nevertheless led losses on Friday, with the S&P 500 bank index shedding -0.40% despite the broader rally to end the week -5.43% lower.